An arson attack which destroyed a new gym based at Moy GAA Club overnight, has been branded “mindless”. The premises, owned by local personal trainer Connell Donnelly, have only been opened around five weeks, it is understood. Connell Donnelly inside the gutted interior of his fitness suite at Moy GAA Club. Fire crews and police attended the scene of the fire last night from around 11pm. Detectives are treating the incident, on the Benburb Road, as arson, and have appealed for anyone with information to get in contact with them at Cookstown Police Station on 101. Mr Donnelly, in a message posted online this morning, said the incident was “an attack on the whole community”. “It is with deep regret and sadness that I should announce that our newly open gym in Moy village was attacked and destroyed in what appears to be a sectarian arson attack last night”, the young businessman continued. “We are still unsure what happened and why it happened but it’s not just an attack on me it’s an attack on the whole community. Local SDLP councillor, Denise Mullen, attended the scene of the fire last night and spoke with Mr Donnelly, who, she said, was “devastated”. Dungannon Independent councillor, Barry Monteith, described the incident as “an attack on the men, women and children of Moy”. A spokesperson for the Northern Ireland Fire and Rescue Service said: “Northern Ireland Fire & Rescue Service (NIFRS) received a call at 10:51pm to a report of a fire at premises at the Benburb Road, Moy area of Dungannon last night (Sunday 3rd April). 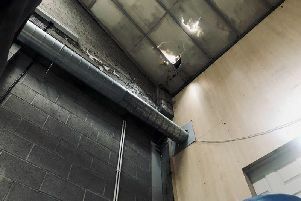 “Two Fire Appliances from Dungannon Fire Station and one Fire Appliance from Armagh Fire Station were deployed to the scene of a fire at a gymnasium in the area. Firefighters using thermal imaging cameras and a hosereel jet dealt with the fire. The building was heavily smoke logged as a result of the fire.